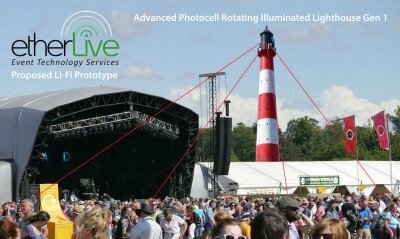 During the summer of 2016 Etherlive will be piloting the innovative new Li-Fi (Light Fidelity) technology at a range of festivals and outdoor events. Operating in a similar way to Wi-Fi the technology uses light rather than wireless signals to transmit data to mobile devices and can offer very high data rates up to 1,000 times faster than Wi-Fi. To enable this existing mast structures used on sites for CCTV and wireless transmission will be converted to ‘lighthouses’ firing out powerful rapid oscillating infrared beams. Early adopters will be offered an adapter for their mobile devices which when worn externally (such as on the head) will receive and transmit a light pattern to the lighthouse. The device can operate with both infrared and visible light so that at night the festival can be illuminated with thousands of tiny LED lights in multiple colours depending on the speed of connection (green for high speed, amber for slow, red for not connected). To overcome the issue of more crowded areas the external antennas will be extendable to provide extra height, and will conveniently double up as a lantern when used inside tents. Etherlive are working in conjunction with Li-Fi developers on this new exciting technology to be known as the Advanced Photocell Rotating Illuminated Lighthouse Gen 1 which can be used alongside our existing range of technology services. Watch out for which events will be supporting this new initiative over the coming months!